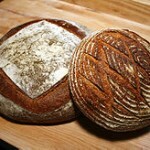 ESP has scheduled an event on Sourdough,for our regular May 18, 2011 gathering. As a lead-in to that event, here’s some information to tempt your taste buds and culinary yearnings. And remember to bring a glass or ceramic jar (NOT metal) to the event, for a bit of free starter! For a printable version of this post, see The EssentiaList: Sourdough (pdf). Long before the invention of bakers’ yeast, sourdough was used as leavening for all kinds of baked goods including those pancakes and biscuits made famous by Western movies & TV shows (e.g., Wagon Train, Rawhide). 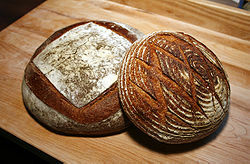 But perhaps the oldest and most well-known food made from sourdough was bread. Like sauerkraut, brined pickles & olives, yogurt, buttermilk, and so on, sourdough is a lacto-fermented or “cultured” product. This process involves the action of friendly bacteria (acidophilus, etc.) on the natural sugars & carbs in foods such as cabbage, cucumbers, and milk. These bacteria turn the sugars into lactic acid, which preserves the food and improves its flavor by adding a slightly sour ‘tang.’ See The EssentiaList: Pickling & Lacto-Fermentation for an introduction to the concept. In the case of sourdough or natural leaven, these friendly bacteria work with natural yeasts from the air and on the grain, to turn the sugars & carbs in the grain into lactic acid, and also to produce carbon dioxide (CO2) to leaven the dough/batter. It is important for the bacteria and yeast to thrive in a harmonious symbiotic relationship, or the starter will fail. Sometimes a failed starter can be revived, so if this happens to you, don’t give up. In ancient times (over 6,000 years ago), humans discovered the basic idea in their attempts to brew alcoholic beverages (beer, etc.) from grains. Somewhere along the line, someone figured out how to leaven bread with the same brew. And then someone else figured out how to share their starter with others, and how to propagate it indefinitely. (3). While sourdough does contain yeast, it is not the same as candida yeast that causes ‘yeast infections’. In fact, the yeast and bacteria in natural leavens such as sourdough actually compete with candida, helping to keep it in check in our guts. The most common uses for sourdough include bread, biscuits and pancakes. But you can also make pastries, muffins, cakes and cookies! Check out Gnowfglins.com: Sourdough. Not Just for Bread (5) for more ideas, and for a sourdough e-course (modest fee required). Also See For the Love of Sourdough: Starting a Sourdough Adventure (6) has several good recipes. Typically, you begin with a starter obtained from a friend or relative. This starter is alive and reproduces itself as long as you continue to feed it more flour. It contains the friendly bacteria and yeasts necessary for leavening. You can also make your own starter from flour and water. One of the beauties of a sourdough starter is that it can live forever, passed on through generations, and shared with friends, provided you feed it regularly with more flour. The best way to start is to be given a bit of starter by a friend or relative. But you can also make your own from scratch. equipment: jar or bowl, and cheesecloth. You should have a viable starter in 1 week. Combine equal amounts of flour and water in a jar; drop in unwashed fruit, if using. Cover jar with cheesecloth to keep out insects but allow air to circulate. Set in a warm spot (at least 68° F), free from drafts. Stir vigorously, at least daily. Eventually you will notice bubbling without stirring, which indicates the yeast is active. After 3 – 4 days, if not yet bubbling, move jar to warmer spot, or add a pinch of active dry yeast. Once it bubbles, strain out the fruit (if using), and begin feeding your starter: add, with stirring, 1 – 2 Tbsp flour daily for 3 – 4 days. Nourishing Traditions (2) suggests moving starter to a clean bowl each day you feed it. The starter may get thicker as you feed it, but you want it to remain mostly soft & liquidy. Add water if necessary (if starter crosses the line from soft to solidity). Once it is a soft, thick, bubbly mixture, it is ready to use. But remember to keep feeding it (see below). See Wild Fermentation (1) or Nourishing Traditions(2) for more. If you are not using your starter at least once a week, you need to feed it anyway. You could simply add a bit of flour every day or too, but eventually you will have too much and it could fail under its own weight. It can also get too acidic, and become putrid from the proliferation of bad bugs. Remove a bit of starter and make something like pancakes, cookies or cakes with it. (OR, if you have a septic system, flush it down the toilet to help keep the septic system working well; otherwise add it to your compost). Then add to the remaining starter an equivalent amount of water as the starter removed, plus the same volume of flour as water added. For example, if you remove 1/4 cup, add back 1/4 cup each water and flour. Stir well, and keep in warm place. 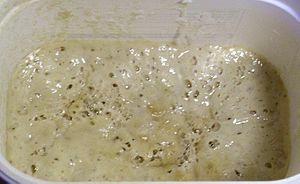 If you have neglected your starter so that it is beginning to spoil, feed it fresh flour until the good bugs again get the upper hand. As you use your starter, remember to keep some in the jar to keep it going. Replenish the starter by adding equivalent amount of flour and water, as you removed. Stir well and leave it in its warm place to bubble contentedly, feeding it more flour every day or two. (see Feeding your starter, above). It is possible to use gluten-free grains to make sourdough, and also different cultures such as kefir, to make sourdough starter. For more on this topic, see Alternative Sourdough Starters. This entry was posted on Monday, April 11th, 2011 at 7:35 pm and is filed under Fermentation, Culturing & Curing, Food-Nutrition-Health. You can follow any responses to this entry through the RSS 2.0 feed. Both comments and pings are currently closed. I enjoy your composing design, do carry on creating! I will probably be back!